I was mighty excited when Lush brought out their Fathers' Day collection this year. They've been creating Mothers' Day products for years but, as far as I know, have never done one for the dads so I couldn't wait to try it out. Now, admittedly, I'm not a dad. Neither is Rich. But I needed to try these products, so I got them ok? The appearance of Superdad is so cute with its retro comic strip starbust shape and DAD blasting out. It also happens to be the slowest fizzing bath bomb that I have ever used. 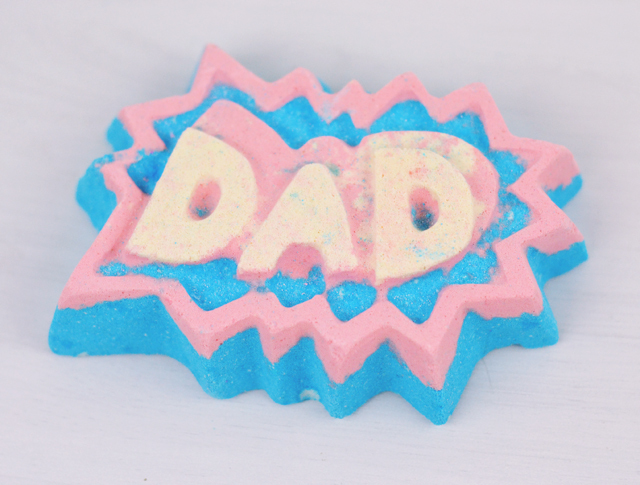 I put it in the bath gently, so it floated on top with the DAD motif face-up, and it radiated pink and blue foam. Even when I accidentally kicked it and flipped it over, it floated back up to the surface and continued dissolving at a snail's pace. You certainly get your money's worth with this one! As it fizzes away, the bath turns into a bright azure blue. Because this is a MAN bath bomb for MEN, it has a really masculine fragrance. I don't tend to favour the terms "feminine" and "masculine" for fragrances but this is the best way I can describe the woody, smoky scent. It's mostly sandalwood oil but also contains frankincense for a heady, musky fragrance that's reminiscent of aftershave and lingers subtly on the skin afterwards. 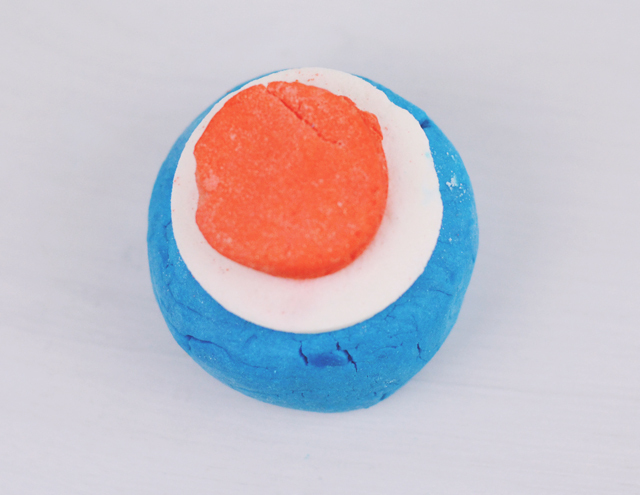 Oh man, I love the 60s vibe of this bubble bar. Look at it. Look at it. 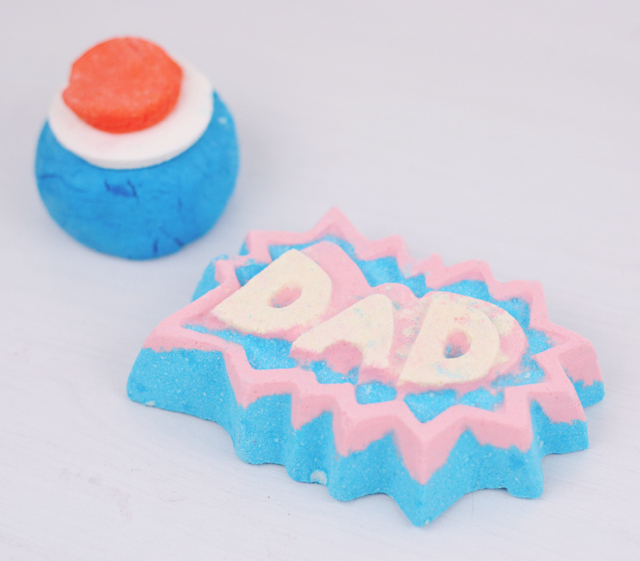 I was pleased to discover that, unlike the other products in the Fathers' Day range, this bubble bar is free from sandalwood. (It's not that I don't like sandalwood, it just seems a bit predictable for products aimed at men) In fact, The Modfather is free of most ingredients. It's straight-up 100% Brazilian orange oil in all its zesty, citrus wonder! Unfortunately, the bubble bar is teeny tiny. I used half in my bath and it provided a decent amount of bubbles but in terms of size, it's about half that of the likes of The Comforter and Brightside. Like Superdad, The Modfather turned the bath water blue (because what's more manly than blue, eh? ), although a slightly deeper shade this time. Although it was a pleasant enough experience, I didn't feel that there was really much in this bubble bar, apart from the design, to make it very interesting. I love the design of the Modfather, but kinda disappointed that it's all a little blue..
A little bit of green or red added might of been a little less predictable! I love the look of these but alas, my Dad doesn't have a bath at his house. Looks like he's stuck with socks and whiskey again lol!